What are the traffic rules for electric scooters such as the Bird? What should they be? These questions are being asked by a wide range of stakeholders following the sudden influx of scooter-share activity in urban areas. Electric scooter rental offers the instant ability to travel at 15 mph between downtown destinations without physical exertion (or sweating), and without the up-front cost of purchasing the vehicle. Although they may resemble a child’s kick-scooter, electric scooter-share vehicles are not toys; nor are they to be confused with disability-assistance devices that move at walking speed. Adults ride electric scooter-share vehicles to travel the “last mile” of an urban journey much faster than they can on foot. 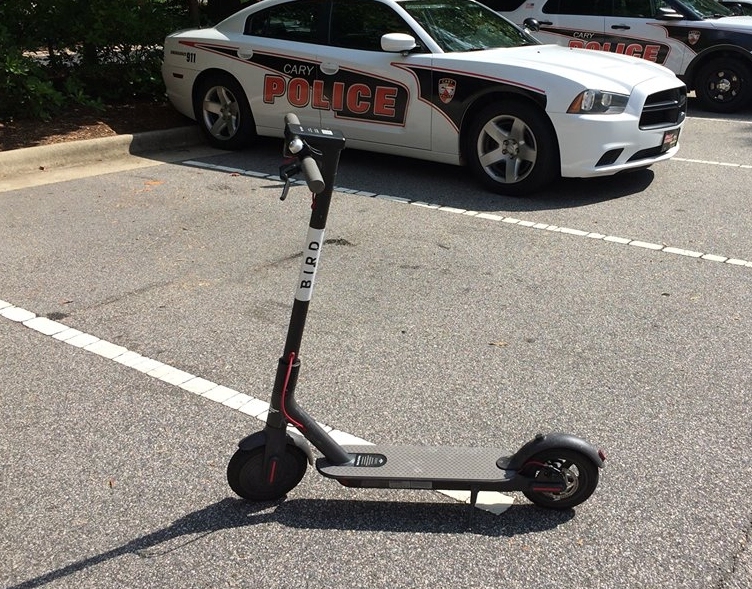 Under existing NC law, electric scooters like the Bird fall under the definition of “moped,” which includes heavier vehicles that can travel up to 30 mph. Moped riders must be at least 16 years old and must wear a helmet meeting the FMVSS 218 (motorcycle) standard. Mopeds require rear-view mirrors and must be registered with the DMV. Some electric scooter-share proponents argue that that moped regulations are excessive and unnecessary for lower-speed scooters. In California, Bird has lobbied for legislation that would legalize operation of scooters on sidewalks – a subject of vigorous debate between pedestrian and scooter advocates. As some lawmakers in North Carolina reconsider the state’s existing regulations for scooters, we encourage examination of applicable traffic safety science and history. Testing reveals that at 15 mph, the Bird scooter has an emergency stopping distance of 30 feet (human reaction distance of 16 feet + braking distance of 14 feet). The Bird can be lifted and turned in place when stationary, but at 15 mph its minimum turning radius is well over 30 feet. The kinematic and dynamic maneuvering characteristics of electric scooter-share vehicles are similar to those of bicycles. The subject of electric scooter safety, therefore, has much to benefit from lessons learned about bicycling. Adult bicycling safety education programs instruct bicyclists how to operate bicycles on roadways according to the basic collision-prevention rules for drivers of vehicles (which apply to bicyclists in every US state) and discourage bicycling on sidewalks. Sidewalk bicycling is associated with much higher fall and collision rates compared to roadway bicycling, especially in urban areas with a high density of driveways, intersections, street furniture, and pedestrians. Particularly hazardous is bicycling opposite the normal direction of vehicle traffic. One of the most common car-bike crash types in North Carolina’s cities is contra-flow sidewalk bicyclists being hit by right-turning motorists who are looking left for vehicles. Although it is possible to reduce some of the risks of sidewalk bicycling by traveling near walking speed, bicycle users are motivated to travel faster. Electric scooter operators, who don’t exert themselves, may be even more speed-motivated than sidewalk bicyclists. We therefore intuit that recommended best practices for electric scooter operation should resemble those for adult bicycling by encouraging roadway use according to the basic rules for drivers. Some electric scooter operators report feeling unsafe or unwelcome on certain roadways, electing to use sidewalks instead. Many bicyclists empathize. From a public policy perspective, however, we posit that if interactions between lower-speed and higher-speed traffic on an ordinary road are deemed unreasonably unsafe, unpleasant, or inconvenient, the prudent remedy is to change the roadway environment in ways that reduce conflicts and/or speeds, and not to push users of lower-speed vehicles onto the sidewalks. Paved public roadways have carried a mixture of wheeled traffic types for thousands of years and their adaptation will continue for many more. Exemption from some existing moped regulations may be warranted for lower-speed electric scooters. A CPSC (bicycle) standard helmet is likely adequate for lower-speed electric scooter falls. Rear-view mirrors are easily broken on such small vehicles, and many riders can either turn their heads effectively or prefer helmet or glasses-mounted mirrors. The low property value and limited public danger of low-speed electric scooters may not warrant the bureaucratic overhead of mandatory state registration. There is growing sentiment that regulating electric scooters more like electric-assisted bicycles would be in the best public interest. And yet, the popularity of electric-assisted bicycles is also a relatively new development, and the implications of mixing them with pedestrians on multi-use paths under existing regulations are not yet fully understood. Democratization of our streets is essential to serving the independence and mobility of a population with diverse needs; public roadways are too valuable to allow them to be monopolized by any vehicle type. As the private and public costs of automobile use continue to rise, innovations that reduce barriers to access and facilitate travel by lower-cost, lower-energy modes are a net benefit to the public. Electric scooters are just the latest in a long history of low-speed vehicles on our roadways. Regulatory proposals for scooters and any other vehicle should be evaluated based on available evidence, cost/benefit analysis, and a commitment to making our streets safer and more welcoming to everyone.